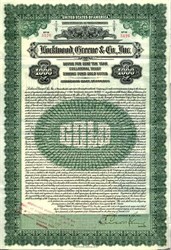 Beautifully engraved $1000 Gold Bond from Lockwood, Greene & Co issued in 1923. This historic document was printed by American Bank Note Company and has an ornate border around it with the companys name on top. This item has the signatures of the Company's Treasurer, Edwin F. Greene and is over 83 years old. This is the first time we have had this for sale and we only have one. Nine coupons attached on right side. Lockwood Greene is the oldest professional services firm in the United States, specializing in industrial engineering and construction. Lockwood Greene traces its origins to 1832, when David Whitman first began offering consulting engineering services to New England textile mills. Whitman became known as "The Mill Doctor," helping mill owners design and operate their mills more efficiently by providing both scientific knowledge and practical know-how. When American textile companies needed healthy advice during the 1800s, the "mill doctor" was there to make a house call. Mill doctors were engineering consultants who provided valuable guidance covering all aspects of a textile mill, including selecting factory sites, designing buildings and power plants and finally supervising construction. Three of the most noted mill doctors were David Whitman, Amos D. Lockwood and Stephen Greene, the first leaders of the company known today as Lockwood Greene. Their practical insight helped spur the development of the U.S. textile industry almost two centuries ago, yet their legacy has grown to affect global engineering and manufacturing technology today. In addition to operating mills, the South needed to provide textile industry education. Lockwood Greene designed several textile schools, most notably Atlanta's Georgia Institute of Technology in 1898. Today, Georgia Tech is regarded as one of America's top research universities. In 1901, Greene's oldest son, Edwin F. Greene, took over the business, expanding into mill management and ownership. The company was profitable until a textile depression struck New England due to Southern competition after World War I. Employees purchased the engineering division in 1920 and continued the business as Lockwood Greene Engineers Inc. The 1920s brought new areas of work, including the design of newspaper and publishing plants, tobacco and food processing facilities, electrical equipment plants and general architecture. Lockwood Greene's largest architectural design during this time was the Atlantic City Auditorium in New Jersey. When the auditorium opened in 1929, it held the record as the world's largest clear span space - 456 feet long and 310 feet wide - under a 137-foot-high barrel vault ceiling. Today known as Historic Boardwalk Convention Hall, this National Historic Landmark is home to the Miss America Pageant. Originally designed in 1913, the Lincoln Highway was America's first transcontinental highway, stretching from New York City to San Francisco. During the 1920s, Lockwood Greene designed changes to the Lincoln Highway, such as improved lighting and bridges, to provide a better driving experience. World War II brought more projects to the company. Its largest wartime achievement was providing architectural and engineering services for Camp Shelby, Mississippi, in 1940. The project covered 10 square miles with 15,000 buildings housing 68,000 soldiers, a hospital, a six-million-gallon-per-day water supply and 65 miles of paved roads. The entire project astonishingly was completed in less than six months. Today, Lockwood Greene generates more than $1 billion in annual revenues and employs 3,000 professionals in 32 offices worldwide. As America's oldest professional services firm in continuous operation for industrial engineering and construction, Lockwood Greene has provided the ingenuity and innovation to promote the nation's industrial development over the last 170 years.